Bastar, April 11: Around 14 per cent electorate cast their votes in the first couple of hours of polling in the Naxal-hit Bastar Lok Sabha constituency of Chhattisgarh on Thursday. At some places, there were reports of EVM snags which were being rectified, an election official in the state capital Raipur told PTI. Lok Sabha Elections 2019 Phase-I Voting Live News Updates: Over 100 EVM Malfunctions Reported At Several Places in Uttar Pradesh, Voting Affected. "Polling in Bastar seat started at 7 am and is going on smoothly. Till 9.30 am, around 14 per cent polling has been registered," he said. Long queues of voters were seen at several polling booths in the region. Early in the morning, Naxals detonated an IED (improvised explosive device) in Narayanpur district, which comes under Bastar constituency, police said. No casualty was reported in the blast. A thick security blanket, comprising around 80,000 state and paramilitary personnel, was thrown across the constituency to ensure peaceful polling. 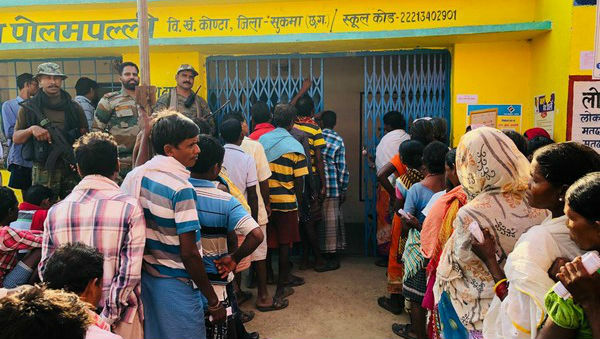 Polling in Bastar Lok Sabha constituency's four Assembly segments - Dantewada, Konta, Bijapur and Narayanpur - is being held from 7 am and 3 pm, the official said. Seven candidates are in fray in the seat and as per electoral rolls, there are 13,72,127 voters, including 6,59,824 men, 7,12,261 women and 42 of the third gender. Assembly Elections 2019 Phase 1 Live News Updates.